Famous tricks of Indian magicians—the well-known rope trick, the mango tree stunt, the basket illusion, the ability of fakirs to withstand pain—are not so superhuman as they seem. Science has pulled aside the veil of mystery surrounding these apparently phenomenal performances, and proved most of them , to be accomplished by natural means. AN INDIAN fakir, sitting on a bed of spikes all day long, is always one of the marvels of India to foreign visitors. Others allow sharp needles to be driven through their flesh, or assume distorted attitudes and hold them indefinitely, all, seemingly, without pain. And, according to the latest findings of science the secret of their success lies in the fact that they have mastered pain, either through mental exercises or by a process, not yet thoroughly understood by science, by which the broken ends of skin nerves are turned back and fail to deliver a message to the brain. Fakirs—who must not be confused with the English term “faker”—are not necessarily magicians, though some magicians also are fakirs. The word, originally a Mohammedan term synonymous with dervish, means a religious mendicant. The word has been adopted by the Hindus and other creeds in India, so it is now in general use. The magic of India, aside from the pain-bearing ability of many of the fakirs, is not remarkable. In fact, Howard Thurston and other magicians who have studied it have discarded much as childish, and improved on the rest. The mango tree, grown from a seed within a few minutes, the famous rope climbing trick, the basket trick, in which a dozen or more swords are run through a wicker basket containing the magician’s assistant, and many others have been produced on American stages by professional magicians with better equipment and more startling results than the Indians achieve. “No Such Thing As Pain,” Says Science Indian magicians imported to this country and Europe also have demonstrated the bed of spikes effect, and one attracted considerable attention as a human pin cushion for long and sharp needles. Live burials also were a novelty until the late Harry Houdini and other magicians duplicated them with trimmings the Indians had never dreamed of. But it remained for Dr. Henri Pieron, noted French psychologist, to solve the ability of the fakirs to bear pain. As a result of his researches science has decided that there really is no such thing as pain, that all pains are imaginary, and probably an acquired instinct developed in caveman days to warn of danger. There are numerous records of people failing to feel pain under intense mental excitement. Dr. Lorenzo Gualiano, an Italian physician, who examined a large number of condemned criminals, recently published his findings that they apparently were incapable of feeling pain, and that hypodermic needles could be stuck into their bodies without the subjects being aware of the fact. Another instance recorded is of a man leaping from a burning building, and some time later, after the fire had been extinguished, suddenly feeling pain and discovering that a nail had been run entirely through his foot. As long as the excitement of the fire lasted he did not feel the pain of the nail. Anatomists have discovered that it is rare for a nerve from the skin to continue unbroken to the brain, where sensations are recorded. Instead there are minute breaks, across which pain sensations jump, just as an electric spark jumps a gap. But in some cases the ends of the nerve, instead of facing each other, are turned back, and no sensation can pass, with the result that no pain can be felt. Mind Can Ignore Pain Sensations It is even possible, psychologists believe, for the mind itself to break these contacts by sending an order to the nerve cells. Such cases are not at all rare, particularly in some forms of hysteria, where certain parts of the body or areas of the skin become insensible to pain. Theatrical hypnotists have often demonstrated this form of insensitivity, induced by hypnosis instead of hysteria. In the Middle Ages one of the tests for witches was to stick pins in various parts of the body to see whether these dead spots, which were supposed to be marks of the devil’s claw, could be found. If the suspect, suffering from a mild form of hysteria, failed to jump at each pin prick she was condemned as a witch. The famous cases of various saints who endured martyrdom without apparent suffering may be traced to a similar in- sensibility induced by mental excitement. Saint Sebastian had numerous arrows shot through his body without any apparent suffering. St. Lawrence laughed and joked with his tormentors while they kept him on a bed of coals, and there are numerous similar examples. Some Races Immune to Pain Certain races, notably the Mongols of Asia, the Hindus, and the American Indians and Eskimos apparently developed a racial ability to’ block pain out of the mind. Sufiism, rising in Persia and Turkey, and Yogaism, in Hindu philosophy, both have developed hypnotism and induced ecstasy by the use of music, drugs, dancing and hypnotic suggestion to a high art. The Hindu god Siva was the great Yogi, and his followers believe that through hypnotism and self-mortification they can attain miraculous powers and the control of nature itself. Indian magic is quite another thing. Howard Thurston says there are thousands of magicians in India, but their methods are simple and their appliances crude. They are not miracle workers, and their tricks are easily detected by an expert. The Mango Tree Trick The famous mango tree trick is the chief stock in trade of many of them, and it is performed in many different ways, but none of them fool an expert magician. In the trick the magician apparently plants a mango seed, covers it with a cloth, makes mysterious incantations, and, removing the cloth from time to time, successively shows a tree of various heights, up to two or three feet. In its simplest form the magician simply provides himself with an assorted collection of mango tree branches of various lengths, and a quantity of cloths. Each time he removes the cloth to expose the growing tree he conceals in its folds a large branch to replace the one just exposed, and when he restores the cloth over the mango pot he removes the smaller branch and sticks the larger in its place. A more finished performance is provided with some advance preparation. A hole is dug in the earth and a small man- go tree, planted in earth on a sheet of cork or board, is placed in the bottom. The earth is then moulded back over the mouth of the hole in an arch until it is completely covered. Plant Grown From Seed Instantly When the spectators gather the performer digs a small hole through the top of the arch and plants a mango seed. He then either covers it with a cloth, or erects a small cloth tent over the spot, and proceeds to water the seed with pitchers of water provided by an assistant. In the one case the water is poured directly through the cloth lying on the ground, in the other it is poured inside the tepee-like tent. The water flows into the hole, floats the cork bearing the plant, and gradually raises it above the surface. When the cloth is exposed the tree apparently is growing out of the ground. The rope trick was long the world’s • most famous magic mystery; famous be- I cause thousands of people had told of it, but no magician was able to find anyone who had actually seen it performed. In various versions the magician was described as throwing a rope into the air, where it remained upright, while either the magician or an assistant then climbed up the rope, disappeared, and took the rope with him. The “Oxygen Drunk” Major Francis Yeats-Brown, a retired British army officer, claims the trick can easily be performed before an all-Indian audience composed entirely of practicers of Yoga, because they can hypnotize themselves into believing anything. The secret is to produce what flyers have come to call an “oxygen drunk” by alternate fast and slow breathing, mixed with holding of the breath as “long as possible, forcing more oxygen into the blood stream than it can absorb. High altitude flyers have had considerable experience in recent years with the effect of too much oxygen in the blood. Frequently they are irresponsible for several hours after landing, talk incoherently, and have all the symptoms of acute drunkenness. 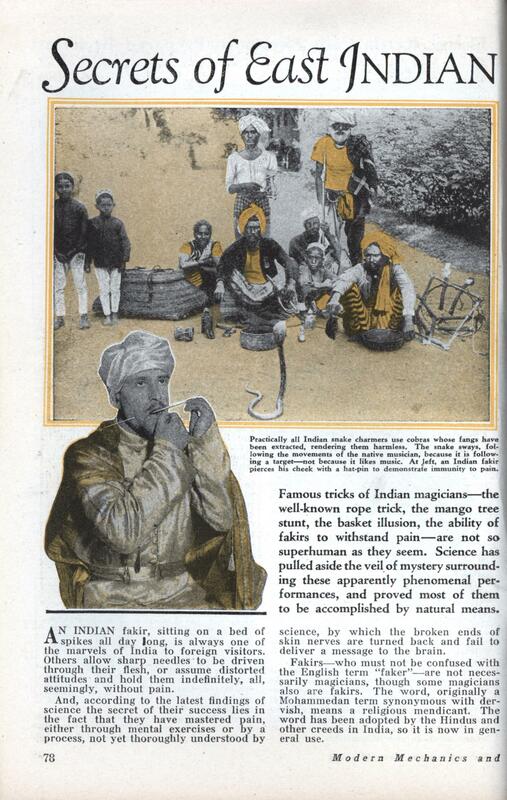 Secret of the Rope Trick An Indian .fakir who tried the trick before Professor Schmidt, a German scientist, did it well enough to fool the professor in the audience, but the German had had the forethought to conceal an aid in the fakir’s house, and the aid saw all the mechanics of the thing. While the fakir set one end of the rope on fire and added powders to the flame to create a dense smoke, an almost invis- ible line was lowered from above, and one of the fakir’s assistants attached it to the other end of the magician’s rope. When the latter suddenly threw the rope into the air the light line was jerked up, and the heavier rope apparently remained rigid in the air. Then, while the antics of the performer kept the crowd’s attention, a heavier rope was slid down the light line, carrying a clamp which closed about the end of the rope from below. 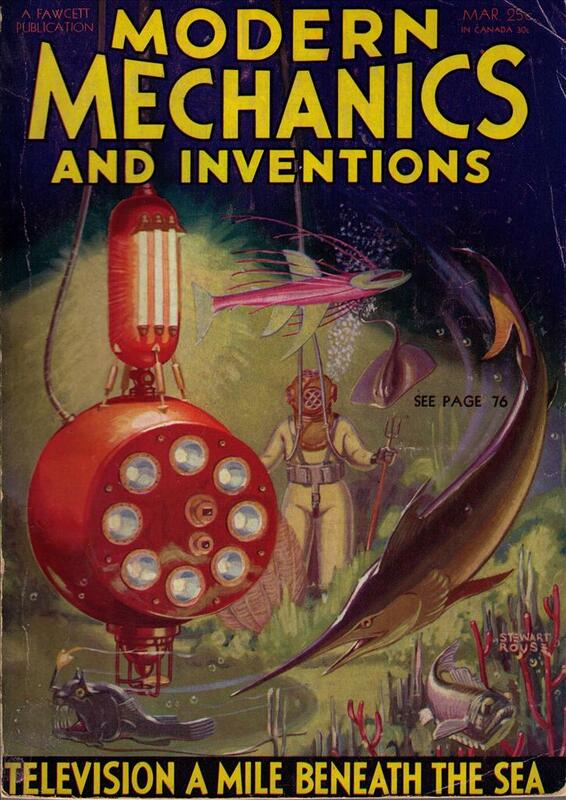 To further obscure operations, a bundle of smoking chemicals and rags came sliding down the light line, and when the magician climbed the rope he disappeared into the dense smoke. The assistants on the ground then distracted attention while he whisked the rope up after him, and descended through his house, to reappear from the rear with the rope in his hand. The rope trick has been performed in this country by Thurston and his assistants without any concealing smoke, but Thurston does not claim it is any more than what it is, a clever piece of deception. How a Bowl of Rice Vanishes One of the common Indian tricks which Thurston has exposed is the vanishing bowl of rice. Apparently a large bowl filled with rice disappeared from beneath the magician’s cloth, only to reappear in the crotch of a nearby tree. The bowl in reality is a wire framework, on which is modeled a thin clay bowl, varnished to appear like a glazed bowl. A tray fits into the top and over it is spread a handful of rice, to give the illusion of a filled bowl. The magician exposes it, then covers it with the cloth, makes a few passes and finally jumps on the cloth, to show the bowl has disappeared. In jumping he knocks the clay loose and crushes the framework flat. Beneath the bowl is apparently one cloth, but in reality two. When the magician picks up the covering cloth he also picks up one of the pair beneath, and thus conceals the remains. In the meantime an assistant has placed a real bowl of rice in the tree, and the magician then calls attention to it. An equally simple trick is the cylinder of fire on a boy’s head. An earthenware cylinder, open at both ends, is placed on a boy’s head, tinder and oil poured in and set on fire. An intense flame results, but the boy suffers no harm. The secret lies in a small ridge inside the cylinder on which rests a circular disk, completely closing the passage. The fire is all above the disk, and the lower half of the cylinder remains cool. Another trick exposed by Thurston is the shooting arrow, discharged by an image at a target, which it always hits, sometimes at distances of many feet. The image is built with left hand extended. In the hand the bow is placed and the arrow, notched to the string, is drawn back and its end placed in the right hand of the figure. Several seconds later, apparently at the magician’s command, the image releases the arrow and it hits the target. The secret is a small bit of wax in the right hand of the figure. The end of the arrow is pressed into the wax, which is strong enough to hold it for several seconds. The magician watches the wax gradually pull out, and just as it is about to release the arrow gives the command to fire, and the figure apparently responds. Not all of the pain-suffering fakirs actually risk pain. One of their tricks is the tub of boiling water, in which the magician immerses himself for as long as he can hold his breath. Actually the tub is nearly full of cold water. Boiling water is poured over the top, then the fakir dives through and rests in the cold water on the bottom. A variation of the rope trick exposed by Thurston is done with a six-foot length of rope which the magician throws into the air, where it apparently remains stiff for a few seconds until he commands it to recoil itself on the ground, when it falls into coils. The secret is a flexible but fairly stiff steel wire running up the center of the rope. When tossed upward the wire will keep the rope stiff for some seconds, and when it falls the wire will drape itself into coils. Indian snake charmers, mostly working with cobras, are a separate branch of Hindu magic. About forty-nine out of every fifty, according to Dr. Raymond L. Ditmars, of the New York zoo, work with cobras whose fangs have been extracted, rendering them quite harmless, but the other one of the fifty will use snakes fully equipped with fangs and poison. Their ability to handle the venomous snakes is more or less a mystery, but it has been suggested that, since the art is passed along from father to son the child may be inoculated while very young with minute doses of snake venom, gradually increasing until he is immune to the poison. Hypnotism Explains Some Tricks Another possible explanation is a species of hypnotism. It is impossible to hypnotize any animal, bird or reptile in the way in which human beings are hypnotized, but they can be controlled in other ways. One of the simplest demonstrations which anyone can make is with a chicken, pigeon or other fowl. Place the bird on a table, hold its head down to the board, and, with a piece of chalk, draw a straight line away from the head, starting at the beak. The bird, with its eyes focused on the line, will remain motionless for considerable time. The trick is often used on the stage to keep birds in place while other acts are going on. The same effect can be attained with birds, and with some animals, by simply holding them under restraint until they cease struggling, then removing the hands. It may be minutes before the subject realizes it is no longer being held. Another way to “hypnotize” a chicken or bird is to rub the bird’s head between the palms of the two hands, twisting it about in the process. The bird becomes so dizzy that it may remain motionless for several minutes after being released. The weaving of a cobra back and forth to the music of the Hindu snake charmer’s pipe is not due to the music, but to the movements of the Hindu himself. That is a common trick used in practically all animal training, where the voice or the music has nothing to do with the action of the animal, who responds only to manual signals. I frequently feed peanuts to the bears in the zoo near my home, and five of the bears, two American grizzlies, two European brown and one Siberian brown, will sit up and beg, stand up, roll over or salute with either paw on command, but it isn’t the command they obey but a small movement of the hand holding the peanut, which they see and understand. Similarly the snake charmer blowing on his pipe sways from side to side, and the cobra, with a third of his length raised to strike, sways back and forth following the moving target. Part of the Hindu’s control over his snakes, however, may be due to the pipe. Dr. Ditmars found that some of the Indian musical instruments, notably the sitar, a kind of mandolin, are capable of producing a few whining notes to which the snakes are particularly sensitive. One note would make a cobra shiver and fall over on its side, apparently lifeless.